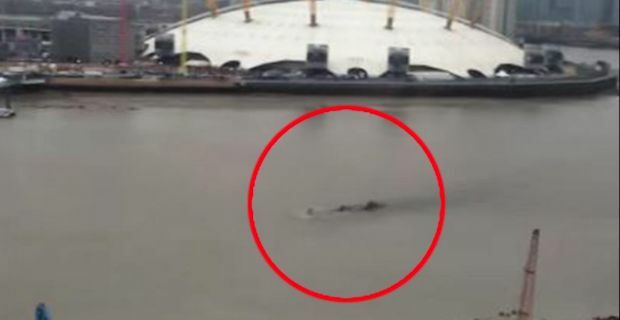 A few days ago a passenger that was in the Emirates Air Line cable car uploaded a shaky video that showed a creature appearing and then quickly disappearing back in the water along the Thames near The O2. Some say it looked to be similar size to the Loch Ness monster while others believe it could just be a lost sperm whale. But this is hardly the first time that an odd object has appeared in the Thames. Here are 5 of the oddest things that have been seen in this famous river. To start the list we begin with none other than MJ himself. To help promote his new album HIStory and the 1995 HIStory World Tour, Michael Jackson had 9 statues scattered around Europe that were each 10 metres high and weighing around 9,000 kg. Imagine driving to work and seeing a 10 metre tall Michael Jackson floating down the river. Dutch artist Florentijn Hofman has also had some rather large creations that have spent their time floating on the river. To mark the beginning of Totally Thames 2014, he created a giant 21 metre long hippo, nicknamed ‘Hippopothames’ that made its way from Greenwich to Nine Elms. During National Ice Cream Week the world's first amphibious ice cream van made its appearance on the river while blasting out Rod Stewart’s ‘We are Sailing’. The goal was to bring more awareness on the drastic reduction in ice cream vans which are due to ‘exclusion zones’, an increase in van operator’s licence, an increase in ingredient prices and much more. Those lucky people that were near ‘HMS Flake 99’ received free treats. Not only have object's been seen in the water, but also many mammals. One 16-foot northern bottlenose was seen in the river in 2006. It appeared that it strayed away from the Scottish waters and unfortunately passed away during the rescue mission by the Atlantic Whale Foundation. So now we can add this most recent sighting to the long list of previous objects that have appeared in the Thames.